Better Enterprise Heavy Duty Telescoping IV Stand (24.5” Cast Iron Base) is designed specifically to safely manage multiple blood warmers, pumps, and syringe drivers and lets you configure the IV stand to best meet your exact requirements. The tilt resistant 6-Leg heavy duty base for Heavy Duty Telescoping IV Stand (24.5” Cast Iron Base) creates ultra stability and gives better performance with much heavier devices. The unique design of knob lock allows you to set the pole at desired height according to the application environment. Heavy Duty Telescoping IV Stand (24.5” Cast Iron Base) comes with 4 durable ram’s hooks which hold items securely and the push button release design allows patient or caregiver to change hooks easily. Besides, there is also the optional stainless steel hook. The telescopic pole of Heavy Duty Telescoping IV Stand (24.5” Cast Iron Base) is constructed of durable chrome plated steel and allows you to safely care for your patients in many health care settings. The selected 3" twin wheel, soft casters allow you to easily move your Heavy Duty Telescoping IV Stand (24.5” Cast Iron Base) from room to room quietly and quickly. Two lockable casters secure the cart in place. Have more requirements for IV Stand? 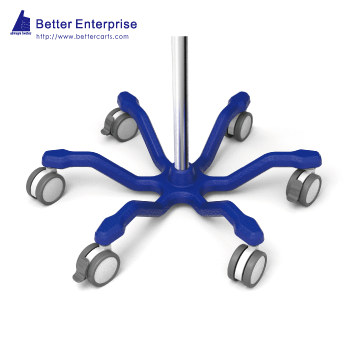 With strong design ability and a wide variety of accessories available, Better Enterprise is also able to create the IV Stand that is tailored to the specific needs of your healthcare environment. Start your own Custom Solution here. BETTER is Heavy Duty Telescoping IV Stand, Heavy Duty IV Stand manufacturer. Supply any kind of Heavy Duty Telescoping IV Stand, Heavy Duty IV Stand over 38 years. You are always the most welcome to contact us Heavy Duty Telescoping IV Stand, Heavy Duty IV Stand Products.